Judy Pfaff’s recent show featured five major wall reliefs (all 2018) that resemble discrete exhibitions unto themselves. The series is titled “Quartet,” with works numbered one though four and a fifth designated Quartet + 1. 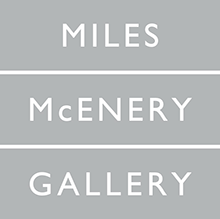 Demonstrating the artist’s distinctive merger of painting and sculpture, these assemblages—which average some ten by fourteen feet and bear elements that extend up to five feet into the gallery space—feature rhythmical arrangements of found objects and items made by Pfaff against backgrounds of digitally abstracted photographic imagery mounted on fiberboard panels. Conflict between technology and the environment, artifice and nature, seems to be a theme of the works, which combine melted plastic buckets and pictures of flowers, wire fencing and biomorphic forms, geometric patterns and expressive painterly gestures. Pfaff challenges the viewer’s perceptive faculties by producing compositions that conflate foreground and background, and that thwart any decisive focal point and even a sense of gravity. Clashing colors and discordant shapes contribute to an anarchic effect, yet a sense of harmony ultimately prevails in each work. In Quartet One, horizontal bands of about a dozen colorful translucent acrylic strips hem in a gathering of large circular shapes set against a field of swirling floral and vegetal forms. A white florescent light placed behind a yellow paper landscape at center left gives the already luminous assemblage and ethereal glow. Into each “Quartet” work, Pfaff incorporated one or more long horizontal paintings on paper that hang on the wall in artist-made wood-strip frames embellished with paint and passages of gold and silver leaf. Consisting of dense palimpsests of mostly abstract imagery, these compositions are integral to the assemblages yet remain somehow autonomous, like modular elements that can be used in different installations or exhibited on their own. In the show’s catalogue, critic David Levi Strauss observes that Pfaff’s “montage of forms is cinematic in scope,” and quotes her saying, “I structure my work the way films are put together.” The especially riveting Quartet Four might evoke a scene from a sci-fi movie. 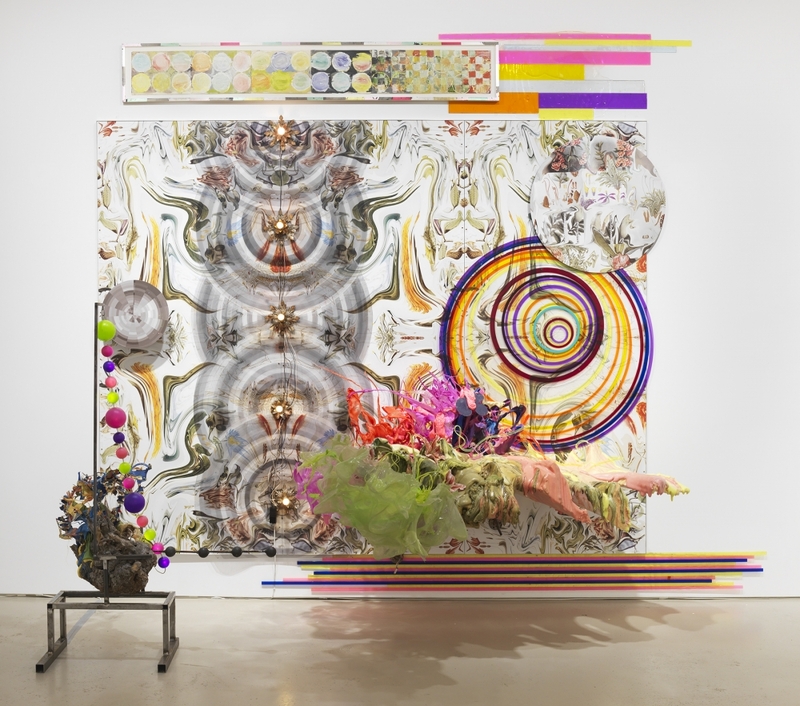 A sequence of several aluminum discs, a woven basket lid, and other circular components unfurls along a panorama comprising mostly abstracted images of plant life. Colored threads drooping along the center of the work help unify the whole, connecting several of the circular shapes, which evoke celestial orbs in an imaginative portrayal of the cosmos.